Discovery Green will energize and engage downtown this fall with a joyful interactive art installation by internationally-acclaimed Mexico City designers Héctor Esrawe and Ignacio Cadena. Los Trompos, or "the spinning tops," will be showcased on the park’s Sarofim Picnic Lawn from November 14, 2015 – March 22, 2016. 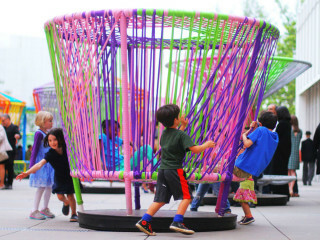 The colorful, large-scale, temporary installation, elements of which take their form from the common toy, will delight park visitors of all ages. The opening celebration will feature music, dance, food and more.